Tying the personal problem to the bigger conflict facing everyone in a story. You’ve heard your Main Character needs some inner conflict, a goal for them to work towards. But you’re never told why that exists or how to develop this very important part of your story. Until now. I’m a huge fan of screenwriting books. Love ‘em. I’ve got two shelves at home stacked with everything from Aristotle to Snyder and each one is well worn. When you have amassed a collection as great as mine you begin to notice patterns within the different texts. One of these is the idea that the central character in a story, the Main Character, must have some kind of internal struggle that exists outside of the struggles that many of the other characters face. Unfortunately that’s usually as far as those texts go in explaining why this is. They rarely offer concrete assistance, and when they do it always seems to be lacking. The Main Character’s central problem is tied thematically to the other problems in a story. It is not something separate or something random that you can just force in there. And there is something very precise with how it should be employed in a successful story. Often, though it is not always the case, overcoming this problem will help solve the problems affecting everyone in what is generally considered the A story line. To clarify this understanding, let’s bring in a real world example. It’s one thing to pontificate about story theory and quite another to see it in action. With that in mind, when it comes to great examples of the Main Character’s central problem we need look no further than everyone’s favorite curmudgeon: Phil Connors. In the DVD commentary for the film Groundhog Day, writer/director Harold Ramis mentions the idea that Phil’s growth of character was modeled after Elisabeth Kübler-Ross’ famous five stages of grief. In order these stages are denial, anger, depression, bargaining and acceptance. Since there are plenty of other places that explore these five stages in more detail, this article will focus mainly on the final stage: acceptance. Stories are all about solving problems. Through the Main Character, we the audience get to experience what it feels like to live with these problems, and if the story calls for it, discover a way to overcome them. If the Main Character resolves their issues (and not every one does), then they have found the appropriate solution to their problems. This is precisely what happens in Groundhog Day. Following the five stages, Phil’s solution is quite obviously Acceptance. PHIL: No matter what happens tomorrow or for the rest of my life, I’m happy now because I love you. Phil has learned to accept his predicament and live in the moment. By doing so, he resolves the problems surrounding him and thus, gets to enjoy the fruits of his transformation. So what then is Phil’s Central Problem? What drives him to do the things he does? What thing is responsible for all the issues he experiences within the story? It’s not enough to simply say Phil starts without acceptance in his life. Going from a lack of something to an abundance of that very same thing offers little in terms of scene development, i.e. it’s boring. A more effective approach is to fill the Main Character with an abundance of a trait that offers the most dramatic tension with the Solution. In Phil’s case, this trait would be Rejection. If Acceptance is allowing something in, then Rejection would be pushing something away. Put the two terms together in a room and watch the sparks fly. That’s the basis for dramatic tension and an excellent model of what Phil’s character arc is all about. PRODUCER: Have you met Rita? She’s really nice. I think you’ll have fun. PHIL: She’s fun. But not my kind of fun. RITA: Would you like to come to dinner with Larry and me? PHIL: No, thank you. I’ve seen Larry eat. PHIL: I would love to stand here and talk to you but I’m not going to. NED: What are you doing for dinner? RITA: Phil, are you going to the groundhog dinner? PHIL: No, I had groundhog for lunch. Phil’s central problem is that he keeps pushing people away, he keeps rejecting them. This problematic attitude continues throughout the first act and into most of the second. It is this trait that causes him the most trouble and is at the center of his personal journey. When he replaces that Rejection in his heart with Acceptance, his problems end, he wins the girl, and tomorrow finally comes. The whole purpose behind analyzing a film’s structure is to determine what the author’s original intent was. Most authors write because they have something to say and because they want to communicate some greater meaning. Analysis seeks to identify this meaning. Usually the process of breaking a film down is a guessing game that is open to interpretation, but with Groundhog Day we have an example where the author is in effect, giving us the answer. If Ramis’ intent was to show Phil growing into acceptance than it follows that Phil’s solution, the one thing that would resolve his personal issues, would be Acceptance. Backtracking, we can see then that to construct a meaningful story, Phil would need to start out driven by a trait with the most dynamic tension with that solution. In this case, that trait would be Rejection—a resistance or a need to run counter to what is offered to a character. This then is the meaning of Groundhog Day and is the reason why so many people hold the film close to their hearts. Phil grows from a person who rejects others to one who accepts what happens to him. In doing so, he solves the logistical problem of being stuck in the same day over and over again, and personally becomes a better person for it. 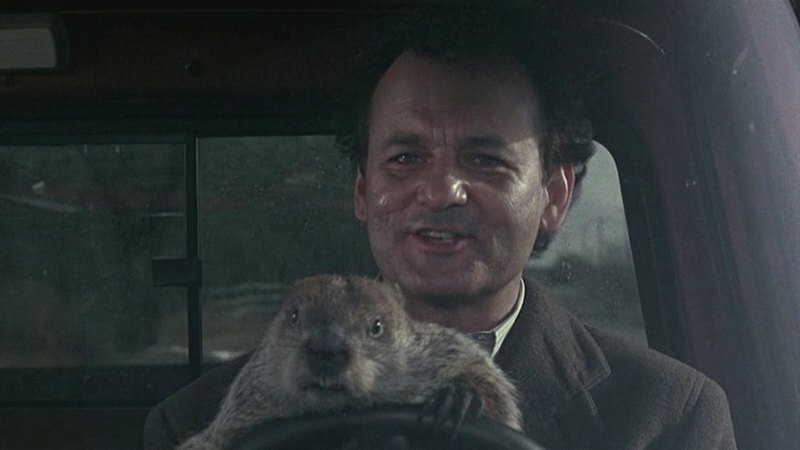 Groundhog Day is a perfect example of structure communicating the meaning. Phil’s central problem is clear, identifiable, and matched with a meaningful solution. Your writing should have the same. According to the above analysis, Phil’s Main Character Problem would be Acceptance and his Solution would be Non-Acceptance (Rejection). The Problem and Solution are always Dynamic Pairs as they offer the greatest dramatic tension within a story. A lack of Acceptance is not the same thing as Non-Acceptance in the same way that a lack of Faith is not the same as Disbelief. This explains why Phil needed to be the kind of person who pushed others away, or rejected them, in order for the story to work as well as it does. Typically, when analyzing a story with Dramatica one starts with the top of the model and works their way down to a finer granularity. Knowing what I did about Ramis’ motivation to use the five stages of grief, I actually started at the bottom of the chart and picked his Solution of Acceptance. From there, the rest of the storyform simply fell into place.